When it comes to comic-book-like super-hero skirmish games, there isn't many to choose from. There's more sci-fi and fantasy games than you could shake a measuring stick at, but super-heroes are simply a neglected topic in the realm of skirmish/wargaming. Sure there's HeroClix, and it is a great game in its own right, but those are all pre-painted plastic models, which are limited to utilizing 1.5 inch square maps. One could argue that there's SuperFigs and the SuperSystem too, but do you really know anyone who plays that anymore? The people who sell SuperFigs models and that game system haven't updated their website since 2009, and they don't even respond to emails. It's clear that they're missing in action. Therefore at present there's really only one super-hero skirmish game that I'm aware of, and that's Pulp City from Pulp Monsters. 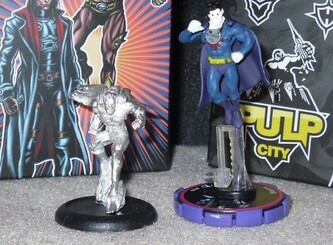 One of the highlights of Pulp City is the models. 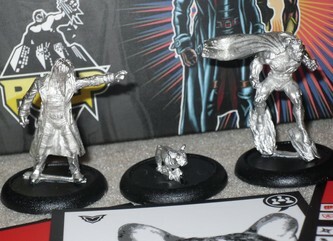 These really are some of the nicest looking 28mm scale super-hero and super-villain models available anywhere. Up until Pulp City came along, the only option we really had was SuperFigs. 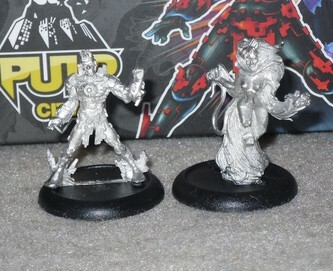 In comparison Pulp City models are more expensive, but they're more impressive in most every way as well. 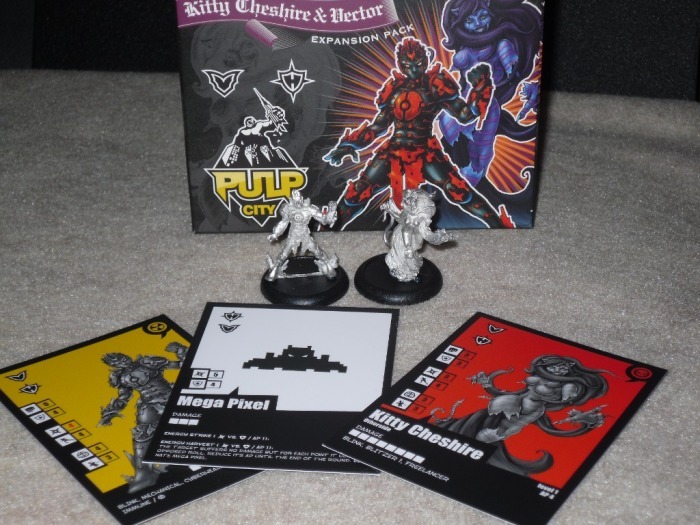 Today I'll be taking a look at two of the Expansion Packs for Pulp City. 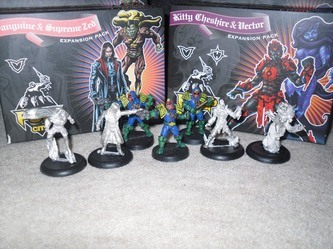 First up is the Sanguine & Supreme Zed Expansion Pack. 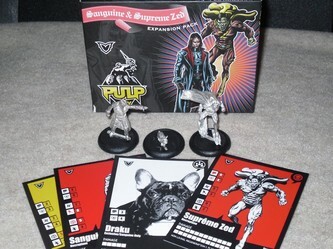 Sanguine is a vampire, and to reflect this he comes with two separate stat cards for use in the game of Pulp City. One card is a Daylight version of Sanguine, the other reflects his stats and abilities at Night. The Day version is considered a Level 1 Nercroplane villain, and the Night version a Level 2 Necroplane villain. 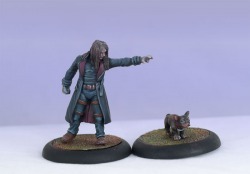 He also comes with a tiny little Level 1 pet dog named Draku, and he's exclusive to Sanguine. The Sanguine model is a single piece casting. There's a single faint mold line running all around the model, but it's nothing a little file and hobby-knife couldn't fix in a matter of minutes. Therefore there's minor clean up, and no assembly to speak of, outside of gluing the model to his 30mm round lipped display base. Although Draku is so tiny, that you'll need a little putty or green stuff to fill in the gap left over after gluing him to his 30mm base. He has a tiny mold line too, but nothing to really complain about. Visually Sanguine is a really nice sculpt. He's wearing an overcoat with what looks like a tactical/super-hero suit underneath. At a glance he reminds me of a cross between a Caucasian Blade The Vampire Hunter, and a male version of Selene from Underworld. He's also standing there posed somewhat like The Crow. The dog is simply cute, and I don't really get the connection there, but what ever. He's a bonus I guess. Supreme Zed is a Level 2 Necroplane villain. This is a 2-piece model. His cape is the 2nd piece, so he's really a single piece casting, with a separate cape. Only minor flash and a faint mold line could be found on Zed. The cape also fits rather well, so assembly and cleanup is very straightforward. 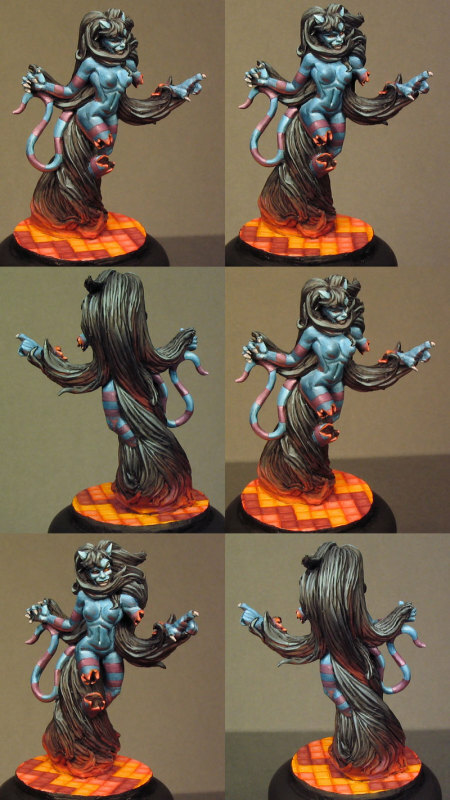 Of all the models in the Pulp City range, this is by far one of my favorite. This guy looks a lot like one of Superman's classic villains Bizarro, only minus the jigsaw-like complexion of course. The other difference is, this guy is an undead zombie super-villain. Although it's perfectly clear that Supreme Zed is Bizarro inspired. 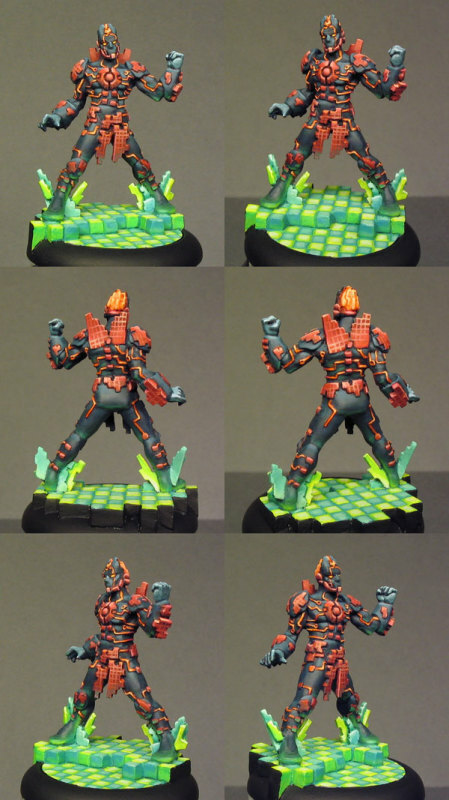 He partially has what you could call a scenic base, because he's standing on some sort of sculpted rocks or crystals, which is part of the model. A 30mm round lipped display base comes standard with him as well. 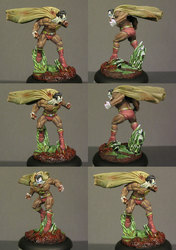 Both Zed and Sanguine were sculpted by James van Schaik. Next we have the Kitty Cheshire and Vector Expansion Pack. This is a unique pack, because both of the models in this pack are not only Level 1 supremes (they call all hero/villains in the game Surpremes), but either one can be a hero or villain. Kitty Cheshire is a single piece model. There's a little mold line clean up to tend with, but nothing out of the ordinary. She's a really unique looking model too. It's as if she's missing sections of her arm and leg. This makes her appear partially phased out, more than injured. It's creepy looking, but also rather cool. In addition to his stat card, Vector comes with a 2nd card called Mega-Pixel which is an exclusive device for Vector only. This guy is some sort of video game hero/villain character, with the digital power of pixels. This is also a single piece casting, so there's no other parts to add or assemble, aside from gluing Vector to his 30mm round lipped display base. At his feet are some digital 8-bit-looking lightning bolts, which look rather cool in a retro sort of way. He looks very Tron-like to me, as all of the shapes making up his costume have a retro-digital 8-bit-like look about them too. Both Kitty and Vector were also sculpted by James van Schaik . That's just the tip of the iceberg. The models I reviewed are some of the more recent releases from Pulp Monsters for Pulp City. 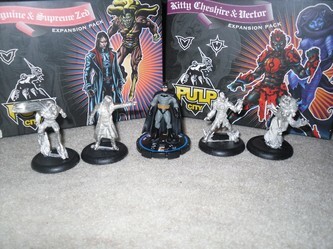 I counted over 30+ individual models available in the Pulp City range, including the models from the Heroes and Villain starters and all the expansion packs currently available. 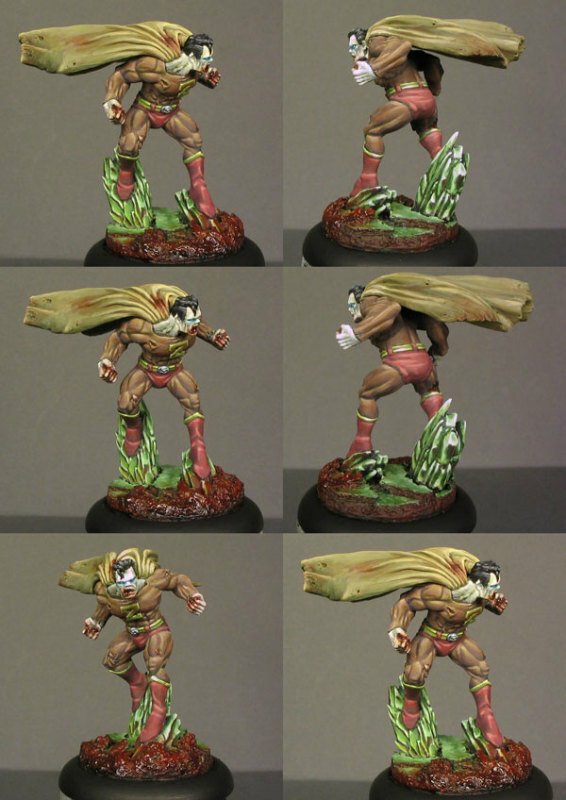 These are some of the nicest super-hero/villain models out there period. As you can see by the photos provided, scale-wise they fit in quite well with some other 28mm scale models too. I think they'd work nicely in Mongoose Publishing's new Judge Dredd game, maybe even Fear and Faith as well, especially Sanguine and Zed since they're a Vampire and Zombie. Cost-wise these models aren't cheap, but they're not overpriced either. The Kitty Cheshire & Vector Expansion Pack for example has been spotted for roughly $15 USD online, and Sanguine & Supreme Zed will set you back about $18 USD. That's quite fair considering the quality of the models. The few single figures that are available run about $10 each on average. The Starter sets for Heroes and Villains come with 5x hero or villain models, for about $40 USD, with an MSRP of $50 for each starter. I think the most expensive Expansion Pack is roughly $25, but one of the models included in it is rather large. So far all of the models they've released are all metal, cast in pewter, so you're getting your moneys worth no matter how you look at it too. I had planned on reviewing the game of Pulp City itself in detail, but the fact is, Pulp Monsters recently announced they'll finally be releasing a true printed rulebook soon. 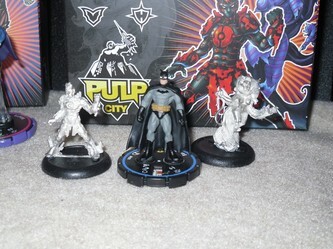 I also simply don't have enough models to actually play Pulp City via the existing free .PDF rulebook if I wanted too. The game is played out with as little as 2x heroes and 2x villains per side, and I was sent 2x Level 1 (Hero or Villain) Supremes and 2x Level 2 Villain Supremes. Therefore I'm one Level 2 hero supreme model short at present of being able to actually play the game as intended. I plan to take a more in-depth look at Pulp City once the rulebook is released. By then I should also be able to get my hands on another hero supreme to properly review the game. Until then what I can tell you about the game is, that it looks like a lot of fun, and it doesn't seem like a terribly complicated game to learn. Best of all, at present you could buy a few boxes of models, and download the rules for free and begin playing right away. So there's no huge initial investment to make to get started with Pulp City. From what I've gathered, all you need is an equal number of Level 1 and Level 2 supremes per side to properly build the smallest team with. Check it out for yourself at their website. 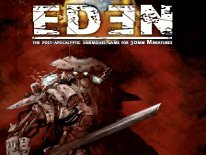 The GameGuide includes all the rules currently available, and best of all it's free in .PDF format.